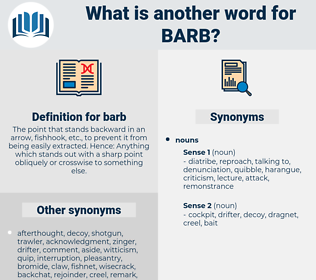 What is another word for barb? The point that stands backward in an arrow, fishhook, etc., to prevent it from being easily extracted. Hence: Anything which stands out with a sharp point obliquely or crosswise to something else. praise, adulation, flattery, commendation, applause, acclaim, accolade. In these ten days he had learned which of Villon's jests were innocent of intention to hurt, and which carried a poisoned barb. The Arab is wise Who learns to prize His barb before all gold; But us his barb More fair than ours, More generous, fast or bold? 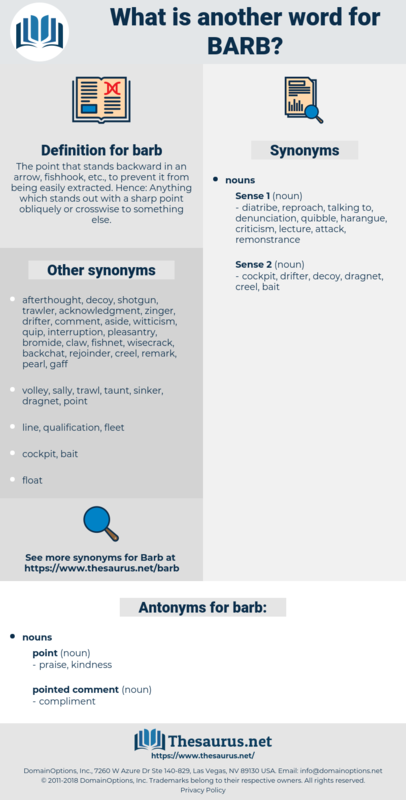 barrier reef, bear paw, barf, barrow-boy, bereave, brewpub, bairava, Barbe, bear off, bar hop, burp, bravo, breve, bribe, barbu, brief, bear up, brave, briar pipe. barbwire, hook, spear, shaft, lance, arrowhead, barbed wire.